Little Rock, Ark. – Southern Bancorp announced today that it would immediately begin providing assistance to customers affected by the federal government shutdown by waiving overdraft fees during this period and providing immediate access to a no fee, no credit check, zero interest loan of up to $1,500. 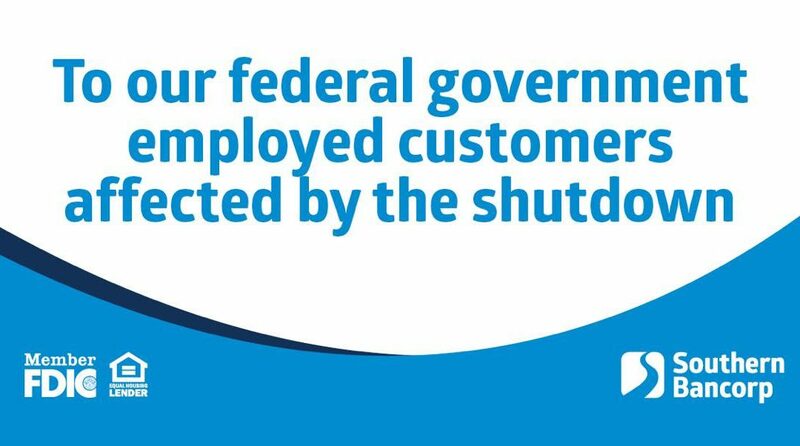 Beginning Tuesday, January 22nd, affected federal government employees who are also Southern Bancorp customers may visit their nearest Southern Bancorp branch to inquire about accessing these options. Emergency loans are payable within six months or upon the resumption of government operations and payroll processing, whichever comes first. Affected Southern Bancorp customers are asked to provide their most recent federal government pay stub as proof of employment when visiting their nearest branch to discuss specific information and guidelines concerning overdraft waivers and emergency lending. Customers may also call the Southern Bancorp Customer Care Center for help connecting with their nearest lender at 1-800-789-3428. For information on Southern Bancorp locations, visit BankSouthern.com/locations.